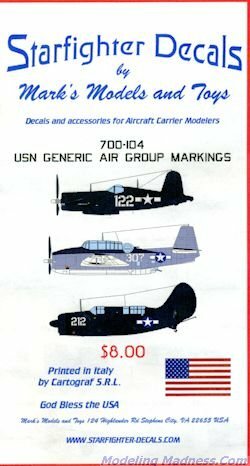 This latest carrier set from Starfighter Decals is for generic air group markings. In 1945, air groups started standardizing aircraft markings. Basicaly this was the start of the geometric markings applied to air group aircraft. It also saw the use of standard numbers with fighters in the 100 series, dive bombers in the 200 series and torpedo planes in the 300 series. While there is no documentation yet discovered to say this was 'law', period photos confirm this trend. This sheet by Starfighter decals provides insignia in both standard and just white as well as numbers for the three types. There are 74 different 100 series numbers, as well as 16 different 200 and 300 series numbers in both 12" and 24" sizes. There are also several of the tape markings used on the forward fuel tank of Corsairs. I know that the white parts of the sheet is nearly impossible to see in the scan, but the markings are there and are well done. The sheet comes with full placement markings for the four major types used at this stage of the war. Starfighter has plans for other markings so stay tuned.